WinchesterOwners.com • View topic - where do i find a bag? 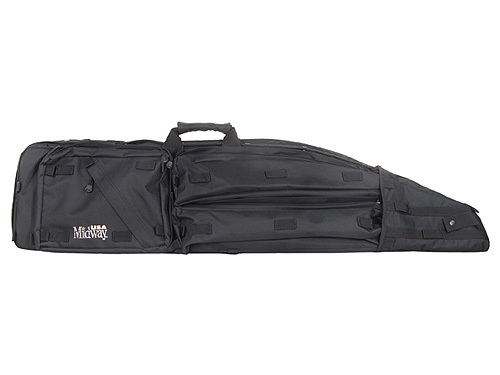 The MidwayUSA Sniper Drag Bag Scoped Rifle Gun Case is perfect for competition or a day at the range. The MidwayUSA Sniper Drag Bag Scoped Rifle Gun Case is constructed of a super tough PVC coated polyester, has reinforced stitching, heavy duty zippers and closed cell foam padding in all pockets that will provide a long lasting gun case that ensures excellent protection for your gear. The 6" loop closure handle is balanced in the center of the empty case for stability and the heavy duty removable backpack straps make carrying this case much easier. The drag bag has a complete divider wall for 2 gun storage. 3 external pockets and 1 internal pocket gives you plenty of storage for all of your supplies and accessories. Please note: If a color you need is not listed in the pull down menu, it simply means we are temporarilly out of stock. Please call us to please a back order or check back later as we add new invnetory weekly. While it looks like an attaché case, it holds far more than your paperwork! In fact, it makes a great active shooter bag for law enforcement officers to keep in the trunk with their carbine. The Voodoo Tactical Terminator magazine and pistol case holds two pistols in external padded pockets and has internal pouches for eight pistol magazines and six rifle magazines. There is also additional storage for a cleaning kit, a pistol-mounted flashlight, an optical sight, and other parts and accessories. Each internal magazine pouch is has a Velcro closure to securely hold and help protect the contents. The other pouches and pockets are zippered. The case itself zips shut and when unzipped it lays flat, giving you easy access to your magazines. 21" wide x 16" tall and 2" deep, not counting the exterior pockets. A great way to discretely transport your guns and ammo to the range, a match, or on a mission. Available in Olive and Black. This listing is for the Terminator case. NOTE: current production works for compact Glock magazines and 1911 sized magazines, but NOT for full sized Glock magazines. Updated and enhanced in 2009, this larger Voodoo Tactical MATRIX rucksack 20"T x 11"W x 7"D) combines the best features of the newest high-tech civilian packs with those demanded by the tactical community. The MATRIX pack is designed for comfort with adjustable, padded shoulder harness and an integral compartment for a hydration bladder (sold separately). Designed for the modern warrior, with a zippered laptop compartment and various pockets and pouches for radios, GPS and other electronic instruments. Large enough to carry plenty of gear, with a large main compartment and multiple pockets on the sides and rear, but not as big as our Tobago bag. Not counting the pockets, the pack measures 20" tall x 11" wide x 7" deep. Includes multiple rows of MOLLE webbing attachment points, or PALs, that allow you to add additional MOLLE compatible pouches and accessories. See our eBay store for an assortment of pouches. Made with YKK zippers for durability and performance. Zippers are reverse to help keep out sand and dirt. Includes aditional straps so you can ad your Voodoo Tactical Drag Bag to the pack. Protect your valuable long guns with 5.11 Tactical Series padded gun cases. Loaded with features to secure your rifles and shotguns along with necessary accessories and ammo, our 42” double long gun cases are designed by operators for operators to carry two different firearms at the same time. Our VTAC double gun cases are built with durable, water resistant 1,050-denier nylon and rugged YKK® zippers. Exterior and interior molle-compatible panels will accept any VTAC pouch or other molle compatible item. The main compartment features dividers in the corners and hook-and-loop lashing points to secure your firearms. A center foam divider keeps your guns separated and protected from scratches or wear. The front smaller compartments include divider panels with molle panels for more options and storage of accessories and ammo. Both the main and front compartments are padded on all sides to protect your critical gear. The 42” double long gun cases feature top and bottom compression straps and come with a backpack straps that can be positions for high or low carry. Bag dimensions are slightly longer than listed to ensure a great fit. We’ve also included a nametape holder, flad holder and ID window. The Pelican 1720 Long Case is an unbreakable, watertight, airtight, dustproof, chemical resistant and corrosion proof hard case used to carry any kind of equipment that needs to be protected from impact damage. It is made of Ultra High Impact structural copolymer that makes it extremely strong and durable. It has a 0.25" (6.4 mm) neoprene o-ring, easy-open double-throw latches that seal perfectly. It includes an automatic purge valve for quick equalization after changes in atmospheric pressure. The 1720 comes with a top folding handle, 2 side folding handles and built-in polyurethane wheels with stainless steel bearings. The padlock protectors provide added strength and extra security against cutting and theft. i have been, the only thing i need is a little thing called money. I'll post my pink one soon! GirlsLoveGuns2 wrote: I'll post my pink one soon!